David Rubenstein is co-founder and managing director of The Carlyle Group, the Washington, D.C.-based private equity firm with more than $70 billion in assets under management. In March, members of the Wharton Private Equity Club (WPEC) interviewed Rubenstein about the ongoing credit crisis, the industry outlook, the rise of sovereign wealth funds, and why private equity is “one of the greatest exports of the United States.” An edited version of the conversation appears below. 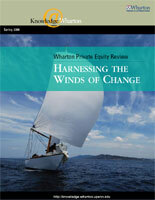 WPEC: How would you describe the near-term outlook and long-term projections for the private equity industry? Rubenstein: From 2002 to mid 2007, you saw the Golden Age of private equity. Now we’re in a period that is the post-Golden Age. During this period of time, probably for the next year or so, you’ll see much smaller deals done. The large deals won’t get done because there’s nobody to syndicate those deals. Secondly, you’ll see non-levered deals where people take minority stakes but they don’t use leverage as much. And you’ll see much more overseas activity from the private equity firms in places such as China or India where leverage in many private equity transactions is not quite as important. It’s clear that some of the greatest growth opportunities for private equity moving forward are in China and India and other so-called emerging markets. And as a result, more and more firms will begin to invest overseas. But once this period is over, once the debt on the books of the banks is sold and new lending starts, I think you’ll see the private equity industry coming back in what I call the Platinum Age — better than it’s ever been before. What you’ll find is that private equity will continue to attract enormous amounts of equity since the rates of return have been consistent and better than anything else you can legally do with your money. And as a result, I think the private equity world will grow even stronger. You’ll see more people getting in — individual investors as well as institutional investors from all over the world. I also think that private equity firms will grow to be much larger organizations than they are today. And most will probably become public institutions. Of course, not all PE firms will be public institutions. There will be enormous opportunities for new firms to get started. But I do think that the private equity industry has a great future and that the greatest period for private equity is probably ahead of us. WPEC: Is the current credit crunch a secular or cyclic trend? Will leverage for buyouts return in time for LPs and professionals to stay with the industry? Rubenstein: The last downturn we had in the U.S. was in 2000-2001. It took roughly three years for leveraged loan volumes to match their previous highs after 2000. And those three years were challenging for private equity investors. In 2001 and 2002, U.S. leveraged loan issuance fell to approximately a third of its 1998 total. But when the recovery came, it exceeded all expectations. Leveraged loan issuance more than doubled between 2002 and 2004 and again between 2004 and 2006. Issuance jumped 20 times between 2001 and 2007. So if you look at these trends you can see a clear cyclic element. WPEC: You have said the PE industry is in its “purgatory phase.” How do you suggest the industry atone for its sins? We didn’t really have that information. Our whole industry didn’t really have it. And now we recognize that if we’re going to be able to function the way we want, we have to be much more aware of the labor unions, the consumer groups, Congress, the media. We have to do a much better job of explaining what private equity does and why it makes companies more efficient. And so during this period of time, I think the private equity industry will spend much more time doing that, and much more time explaining to people how we create value, why we deserve to get compensated the way we get compensated, and why it is a good thing for our economy. We need to do a better job overseas as well, explaining to countries why allowing an American investor to buy something in their country is actually good and will propel their economy forward and ultimately make their companies more efficient. WPEC: In a 2006 Forbes magazine article titled, “Private Inequity,” the authors wrote that buyout executives “don’t make their fortunes by discovering new drugs, writing software, or creating retail chains; they make their money by trading existing assets.” How should the PE industry respond to such criticisms? Rubenstein: When I was in the White House, it was generally thought that Japan would overtake the United States as a dominant economy in the world. This was in the late 1970s and early 1980s. And that didn’t happen. Why didn’t it happen? Well, the Japanese system wasn’t as efficient as people thought at the time, but in the United States, we had become a little flabby in our economy. And we began to retool ourselves. Now, private equity doesn’t deserve all the credit for it, but the techniques that private equity developed have helped to make companies more efficient. They do make workers more motivated and they do produce the kind of returns that I think enable the system to move forward and be a very efficient engineer of capitalism. This is what the data shows. And by the way, private equity is one of the greatest exports of the United States. We have very few businesses in the United States right now where we’re the dominant force in the world. We are the dominant leader in the world in private equity. If you take the 10 best known and largest private equity firms in the world, I think eight or nine of them are United States-based. That probably won’t continue forever. But I do think the private equity industry will thrive and will prosper in part because the returns are so good and because the value creation techniques actually work. It turns out that if you give a manager a large piece of a business, if you have people who are investing in the business, putting their own money at risk, and if you can operate in a private setting to a large extent, you can create value. And we need to do a better job of explaining that to a wider audience. WPEC: Should people invest in private equity now? Rubenstein: The truth is that when you are in economic turmoil or when it’s harder to find financing, those are historically the periods when the best private equity deals have been done. If you go back and look over the last 20 years and check when the best deals were done and when the best returns were generated, it was actually in periods like this. So it’s a very good time to invest. I think one of the problems right now is that we still have a denial phase [among sellers]. As values have come down a bit, a lot of the sellers are saying, “I think my company was worth X. Now it’s only worth 80% of X. So I’ll wait for awhile.” And sellers are probably going to take six to nine months before they realize it’s not coming back to X anytime soon and so they probably will sell. But once we’re through that, I think we’ll see some extraordinary deals and extraordinary returns generated for investors. WPEC: Do you see sovereign wealth funds replacing PE firms as preferred sources of capital for corporations looking for new capital? Rubenstein: Sovereign wealth funds have purchased substantial equity stakes in several alternative asset managers over the last few years. China Investment Corp. invested $3 billion in Blackstone, and Abu Dhabi’s Mubadala [Development Company] invested $1.4 billion in Carlyle. Dubai International Capital invested $1.3 billion in Och-Ziff. They are among the private equity industry’s largest individual investors and they manage enormous amounts of money. In the future, sovereign wealth funds and private equity firms are likely to pursue large investment opportunities through joint ventures. Sovereign wealth funds will benefit from PE firms’ deep pools of investment talent and deal expertise. I think the relationship will be collaborative rather than competitive to a large extent. WPEC: What are some of the factors that you think have been responsible for Carlyle’s success over the last 20 years since you founded the firm? Rubenstein: When we started Carlyle, it used to be the case that you were in the buyout business or the venture business or the real estate business or something that was very specific. We came up with the idea that you could be in multiple businesses and have multiple funds. We now have about 60 of them. And we also, as part of this, came up with the idea of doing this around the world and so we’ve made it a global business. It’s now at the point where we have about a thousand people and about 550 investment professionals. We’ve had a 26% net internal rate of return on realized corporate investments over 20 years, which is a good track record. WPEC: Is private equity still a good industry for young professionals launching their careers? Rubenstein: The phrase “private equity” hadn’t been invented in 1987 when I helped start Carlyle. Today, I think it is a great industry for young professionals because you learn the business of being responsible for something. You learn the business and the idea of actually having accountability. You are not just an agent for somebody else. You’re really making something happen. And the beauty of the business is that once you learn how to make investments, once you learn how to oversee companies, once you learn how to work with management, you can do it from anywhere. With investment banking, although it’s a great business, you generally have to be in the large cities. But with private equity, you can do it almost from anywhere and you can start your own business. So if you specialize, develop knowledge in one industry, you can make a great success of yourself and ultimately find it emotionally and physically and financially rewarding. I hope all of you will, as you build your careers, always think about the society in which you live and the communities in which you live and always try to give something back to your community as well as something to your own family.